The hosts fielded a back three comprising of Toby Alderweireld, Davinson Sanchez, and Jan Vertonghen. Eric Dier played as the devoted 6 flanked by two 8’s, Christian Eriksen and Moussa Sissoko. Son Heung-Min played as the left wing back and with Trippier on the other side. Upfront, Delle Alli paired with Harry Kane. With this lineup, Tottenham would emphasise their circulation and progression through the left side with Son, Eriksen, and Alli, collectively, arguably the better ones for ball-possession and tight space combination compared to the opposite side where Sissoko and Trippier filled the right side. Within their build up play, Mauricio Pochettino’s boys circulated the ball through the back three. In this early phase, Eriksen on the left half space and Sissoko on the right one would drop deeper to help advance the attack which consequently pushed the wing back higher up the pitch. In their progression into the deeper area of Swansea’s defense, Alli and/or Kane would also drop to the 10 or even 8 to establish strong overload for Tottenham in the half space to create access into the 18-yard box. Initially, the task to link up the play from the back to the more advanced areas through the ball side was Eriksen’s. One method Tottenham used to progress was the left half back played a quick pass into the near half space to Eriksen followed by a pass from Eriksen to the ball side wing back (Son). From here, Son would get into the central area trying to find space for a shot or through pass into the box. 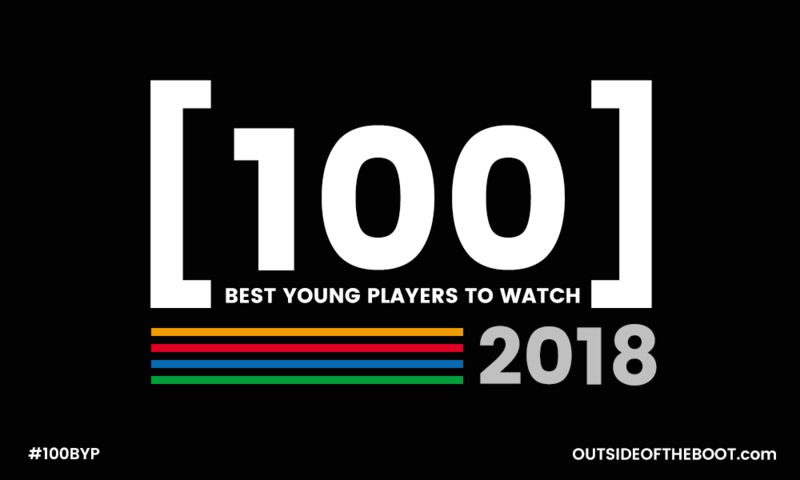 The other method was to switch the play from left to the right side supported by the horizontal ball oriented shift from Eriksen and/or one of the Alli/Kane. From this right half space, after some interplay, Eriksen or Sissoko would play a floated cross either to the central area of the box or to the blind side area on the far post. In their first wave of press, Kane and co went with a high block that was man-oriented. Three players would press three Swansea City’s defenders. Alli and Kane was supported by either Sissoko or Eriksen – depending on who got the better pressing access – to press Swansea’s 1st line. Swansea responded by playing it long, right to the wing back or Tammy Abraham as they relied on his aerial ability. Tottenham 2nd line managed to keep their distance close to the 1st line which arguably was the reason they could regain more ball recoveries. With basic shape of 5-3, Tottenham’s midfield-line managed to put Swansea’s midfield line behind their cover shadow which helped Tottenham midfielders trio to recover. 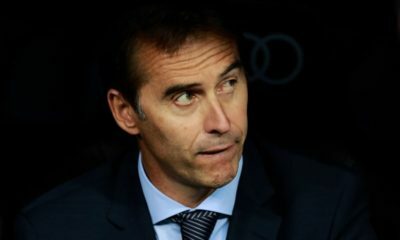 On the other side, the fact that Paul Clement’s troops were focusing on the stability of their deep block made it more easy for the hosts to win the 2nd or 3rd balls after the said aerial duels. The away side defended in their deep block using a 5-3-2 and applied a position-oriented one. In their initial move, the striker duo occupied the 6 space; the ball side 9 kept Eric Dier behind his cover shadow while trying to develop the pressing access by gradually getting closer to the ball carrier (Alderweireld, for instance) as well as blocking the passing lane from the ball carrying half back to the near 8 (Sissoko, for example). The midfield trio’s initial task was to mark Tottenham’s midfielder trio. Two nearest midfielders to the ball stayed close horizontally and secured the near half space and center. In such a situation, Alli or Kane would drop slightly deeper to occupy the space between Swansea’s lines to provide progression access for the ball carrying half back. 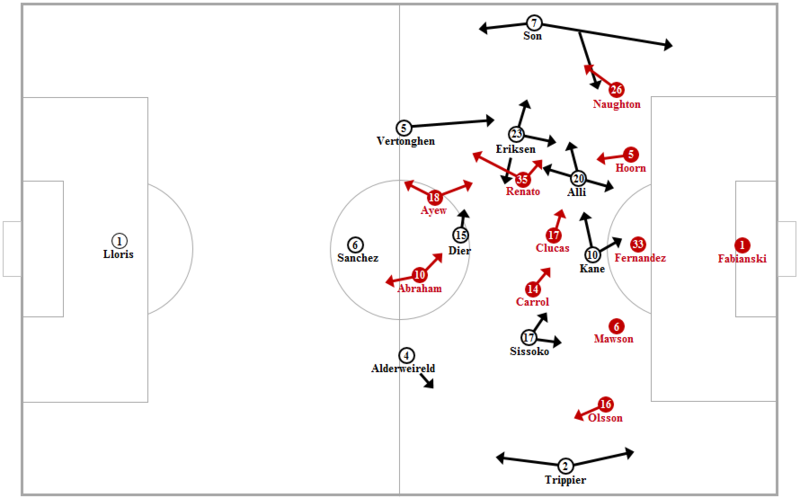 The key for Swansea on how to deal with such movements was the pressing from their back line. For example, if Delle Alli occupied the said space on the Swansea’s left half space, then the defender to follow Alli was Alfie Mawson. If Alli was about to receive a pass, Mawson had to step up to put a press from Alli’s behind. Both wing backs in Swansea’s defensive block oriented themselves to Tottenham’s wing backs. The ball side wing back stayed close to the opponent’s wing back. The far side wing back had to keep the far side opponent’s wing back under his watch as well as secure the space beside Swansea’s far side half back. When Tottenham managed to move higher and deeper into Swansea’s defence, the two strikers of Swansea had to adjust their positioning. They had to drop deep to help the midfield trio to establish vertical compactness in front of the middle line. Usually, when one of the forwards dropped off to the middle line – in the half space, for instance – the other one would stay slightly higher and block the back pass to Tottenham’s 6 or near defender – depending on the situation. One of the main features in the match was how Tottenham overloaded the higher left sector in the middle third and deeper final third against Swansea’s block shifting. 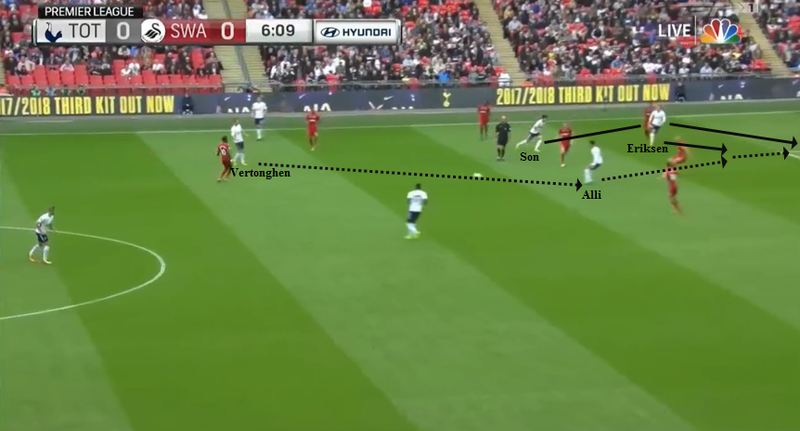 As briefly explained above, the occupation of the ball side half space by Eriksen or Alli was the key for Tottenham to create access into the deeper area of Swansea’s defense. At times, with the dynamic movement of Son and the close distance among players within the local overload, Tottenham managed to get into the center. Son cut inside, Eriksen deceived the wing back, Kane and Alli provided wall pass option. 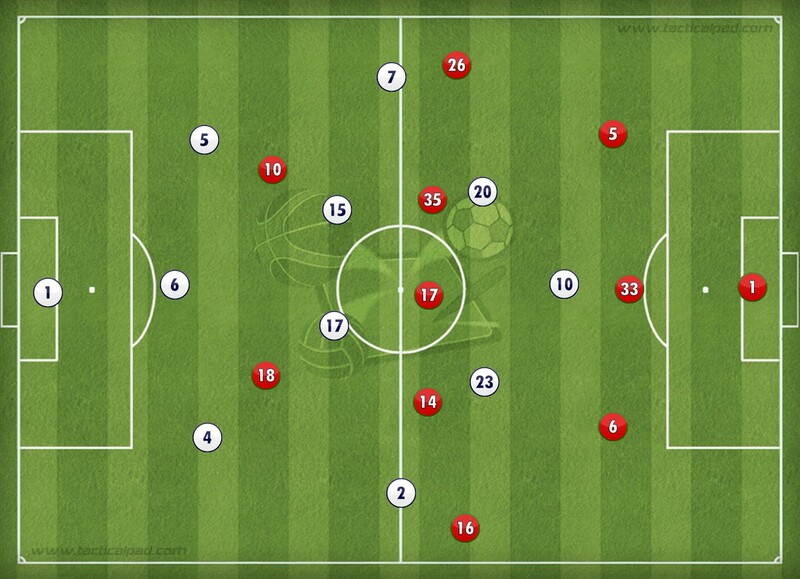 Interestingly, this situation was generated after Tottenham failed to gain “clean” room on the right half space. Tottenham’s players then switched the play from the right half space to the left one. Here, Dier’s off the ball movement dragged Andrew Ayew to the right half space which in turn generated the passing lane for Sissoko to switch it to Davinson Sanchez. From Sanchez, the ball was forwarded to Vertonghen followed by quick passes to Eriksen and from Eriksen to Son. The clip was one of the situations when Tottenham’s players invited Swansea’s block to the right side before they switched to the left side. Dier’s off the ball movement was key here and the reason Sissoko could access Sanchez in the first place. Dier dragged Ayew away and opened passing lane from Sissoko to Sanchez. The next interplay, in turn, ended up with Tottenham managing to get into the center and had a shot by Son. There was another tactic within Tottenham’s switch of play. Delle Alli stayed on the left half space while the ball was around the right half space. 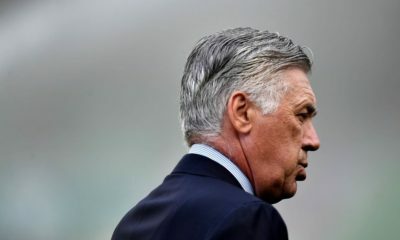 Alli understood that Swansea midfielder trio would make the ball-oriented shift, which meant the space beside Swansea’s far ball midfielder (Renato Sanches) would be opened. As we can see, there was a back pass from Trippier to Sanchez then followed by a quick vertical pass to Alli. See also how Van Hoorn’s onward press and Ayew’s backward press managed to eliminate space for, respectively, Eriksen and Dier which forced Tottenham to play it back. Tottenham then progressed their attack through the left touchline, but again, Sawansea’s spatial compactness made it easy for them to generate easy pressing access, as shown by Kyle Naughton who managed to stop Eriksen from progressing. But, again, a quick vertical pass into the half space – after the recovery – provided a triangle combination and third man run among Alli, Eriksen, and Son that allowed Tottenham to get into the box. Unfortunately, Eriksen’s pass was too heavy for Son. Swansea’s striker pressing behavior was also crucial. 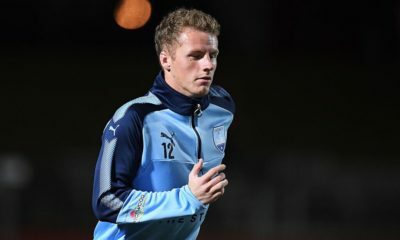 This particularly can be identified when Tottenham’s half back stepped forward to help establish strong progression structure. The half press by the forward supported by spatial compactness around the ball sector often pushed the circulation wider. And when the ball carrier insisted on playing a vertical pass, the said strong spatial compactness, once again, had initially established easy pressing access to the Tottenham’s receiver. But it was no easy task. At times, Ayew and Tammy lost such an access which meant there had to be someone else from the middle line to cover the forward move by Tottenham’s half back. And when Renato Sanches, for instance, picked up the responsibility, it consequently weakened the cover on the half space around 8 and 6. This is the situation where Tottenham’s #10 gained space on the half space to receive a vertical/diagonal pass. Actually, the situation became more complex. Why? Because when Renato did such a cover action, the near wing back was the one to cover Renato as well as keep an eye on the Tottenham player who occupied the ball side half space. This (also) means, Swansea allowed space for Tottenham’s ball side wing back. But, on the other side, Clement’s boys seemed to be ready for this situation. The near half back would move wide to press the opponent’s ball side wing back. And the good thing was the collective backward press from the middle line was able to cover the wide movement by the ball side half. Such coordinated press caused Tottenham to lose the progression access. After 25-30 minutes, there was tiny adjustment by Tottenham’s players. Sissoko moved towards the left half space more often than before. 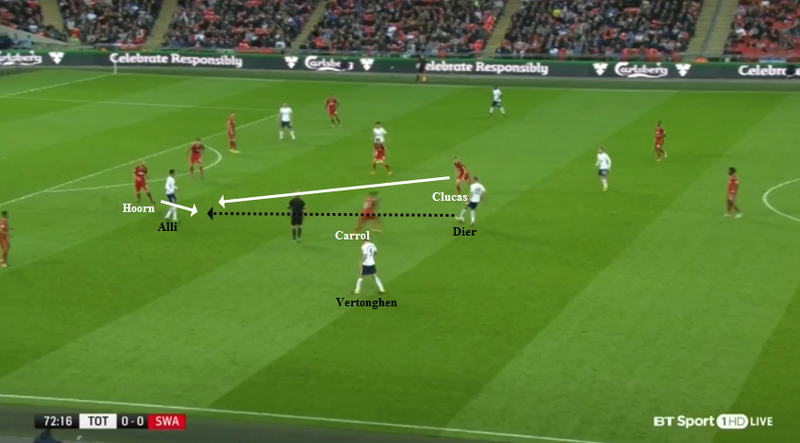 This positively impacted Tottenham’s overload, as Sissoko got into the local overload and provided more orientation for Tottenham to vary their circulation within the local overload. With Sissoko got himself involved in the overload, Tottenham were provided more options to make gradual switch to the far half space or simply gained the opportunity to play up-back-through pattern to manipulate Swansea’s pressing block. 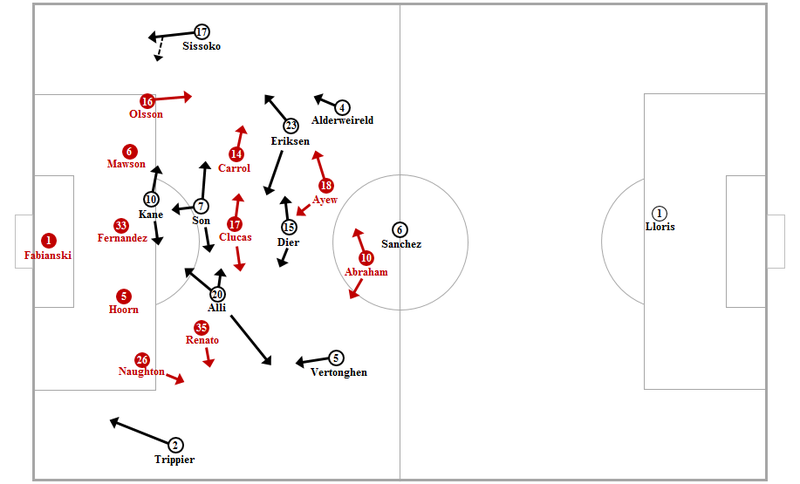 Different patterns emerged when Tottenham varied their attack through the right half space. As they used to do last season, Eriksen was the one to release floated crosses into the box when Tottenham attacked the right half space. We can also see similar pattern here in this match. Different personnel naturally influenced Tottenham’s way of attack. Tiny space combination on the left half space can be generated as much as possible since they had Son, Alli, and Eriksen compared to the resource on the right hand side with Sissoko and Trippier who are suited to a more direct style. https://t.co/Cq4aotEiDi Tottenham varied the attack by attacking the right HS. How to create space for Eriksen to make a float cross. After a diagonal pass by Dier, Swansea shifted and overloaded their left half space. Tottenham dealt with it by creating interplay among Sissoko, Alli, and Tripper. The behaviour of Alli and Sissoko showed the way they created space for Eriksen to gain more comfortable space for a cross into the box. Trippier played as the left wing back; Sissoko shifted to the right wing back; Son in the center along with Kane, Alli, and Eriksen. 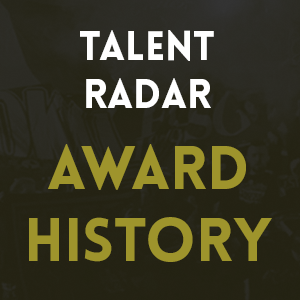 Tottenham’s half backs positioned even higher, often in the same line with Dier. Eriksen was slightly deeper than Alli in build up. But, they were the ones to occupy the half space in the middle third during the progression from deep build up into the final third. Tottenham emphasise their attack to the right half space, although they also attacked the opposite left hand side. More long distance shot within 20-25 meters from the goal. In the final third penetration, Eriksen, along with the half backs, were often found occupying the 8 space in the half space as they had been tasked to make forward pass to the onrushing forward in the box. Andrew Ayew occupied deeper areas. He was often found pressing the flank and/or the center trying to nullify the potential impact created by Tottenham’s 6. Renato, who swapped with Carroll in the last 8-10 minutes in the first half, went back to his initial post on the right side. Alli and Son (also Kane) were tasked to get into the box to receive the forward pass from either Eriksen, Alderweireld, or Vertonghen. The method they used to deceive the back line was a back and forth movement. For instance, the moment from the very first minute of the second half. Eriksen who occupied the intermediate defense of Swansea immediately dropped off to the 8 to give space for Alli to run into the box to receive a forward pass from the ball carrier. https://t.co/nTidRHaeur Eriksen and Alli swapped position and deceived the back line; Alderweireld forward pass. Tottenham used this method over and over and almost gained maximum effect when a pass from Alderweireld to Son provided a chance for the Korean. Again, in this situation, Alli deceived the back line by making a back and forth movement within the space in front of Swansea’s back line. 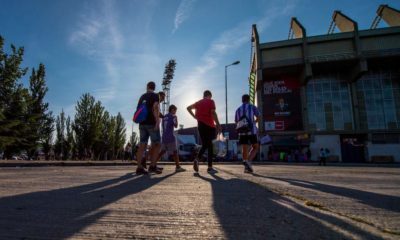 One method taken by the away side to overcome such a threat is blocking the diagonal lane – from the wide area into the box – as well as keep the spatial compactness maintained plus the support by the back line players with their onward presses. Although Tottenham sometimes could still find space in front of the defense in the half space, but overall Swansea managed to properly apply this method. Swansea against Tottenham right half space attack. Federico Fernandez’s onward press and Sam Clucas’ backward press halt Tottenham from progressing and forced them wide. In a 5-3-2, backward press and onward press with proper timing is paramount. Why? Because in a 5-3-2 it is a hard task for the midfield trio to shift horizontally and constantly. It’s nearly impossible, to be fair to constantly deal with the opponent’s horizontal circulation. In the match against Tottenham, we can see sometimes Swansea faced such a deficiency and allowed space and time for Tottenham. But, to the credit of Clement’s side, the pressing coordination often managed to isolate the progression, as shown below. Swansea covered the 6 space. Carroll shifted far from the left side to the right side. As there was huge space to cover, it was difficult for him and the trio, collectively, to secure the line constantly. Let alone, in this scene, there was lack of support from the forward line. Dier and Vertonghen made use of such a situation. A pass from Vertonghen to Dier opened a passing lane from Dier to Alli. But it was the good day for Swansea defense because Clucas and Van Hoorn managed to coordinate after Alli received the pass. The two-direction press stopped Alli from creating a more dangerous situation.